A slab of the bridge over Andheri Railway station has been collapsed today's morning at around 7:30 am and fell on the rail track. Gokhale bridge was connected with the Andheri's West and East, collapsed due to heavy rain in the Mumbai. Since Monday night it has been raining in the city, say reports. The bridge collapse in wee hours has widely suspended the services of the local trains on the Western line. Two people are injured, said Police. According to the Mumbai Police, they are checking whether if people are trapped under the debris or not? BMC, fire brigade, Railway Police Force staff have all been rushed to the spot. Overhead wires were also affected, said, officials. Police have also stopped all traffic above and below the bridge. However, four fire brigade vehicles have been rushed to the location, ANI reports. 10:35 (IST): Out of 6 injured, 2 critical admitted in ICU. More people expected to be trapped under debris. BEST has said it will run more buses to make up for the disruption in train services. In a tweet, Mumbai Police said the trains on Western line were affected, with traffic below the bridge stopped for now. "Commuters might face traffic congestion on roads leading to the Airport. Plan your journey accordingly so that you are in time to catch your flight" tweets Mumbai Police. 9:41(IST) 5 injured after Gokhale bridge collapses, rushed to hospital. 5 injured sent to hospital. Don't think anyone is trapped under debris. Railway admn, RPF, GRP, City Police are present & clearance of debris underway. Railway will probably starting functioning in next 4 hrs, says R Kudvalkar,Railway Protection Force on Andheri bridge collapse. Central railway has extended routes of some locals to clear extra rush from Ghatkopar station after part of Road Over Bridge collapsed in Andheri West. 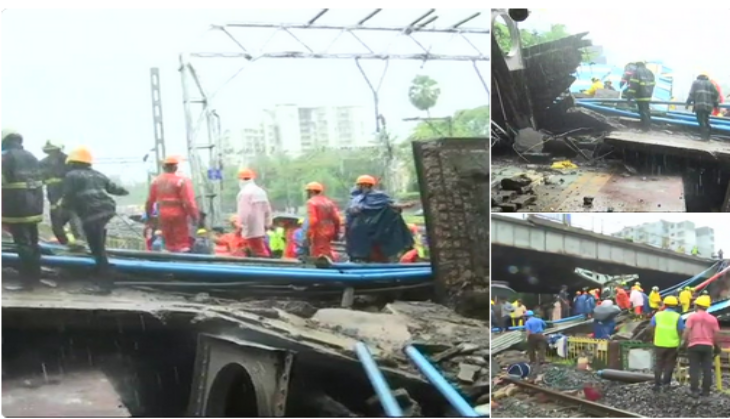 According to latest reports, at least 1 person has been injured in the Andheri bridge collapse. More details are still awaited but reports said that BMC officials are on the spot. That apart, 4 fire tenders have been deployed in the area too. According to reports, a person was killed after a wall collapsed in Thane. Four people were injured in the incident. Part of Gokhale Bridge, connecting Andheri East to West, has collapsed affecting the overhead wires too, Mumbai police confirmed in a tweet. "Trains on the western line are affected.BMC,Fire Brigade as well as RPF Staff & Officers are deputed on spot for support.Traffic above and below the bridge is stopped for now." Mumbai has been witnessing constant heavy rains for over 18 hours now and according to reports rainfall has crossed 90mm in some parts of the city, Intermittent heavy rains are expected to continue today. According to reports, a part of a bridge in Andheri West collapsed on Tuesday. Four fire tenders have been rushed to the spot. Railway services have been suspended from the station. According to the India Meterological Department (IMD), rains are expected to lash most areas in Maharashtra's Mumbai, Thane and Palghar districts on Tuesday. While Mumbai is expected to receive heavy rainfall in some areas on Wednesday and Thursday, "heavy to very heavy rainfall" is likely on Friday and Saturday, for which the IMD has marked "alert".